Boston youth are invited to enjoy a summer of exploration, excitement and fun at Boston Neighborhood Network. 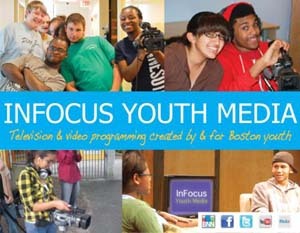 The InFocus Youth Media Program is a four-week summer program that provides training and hands-on experience in television production to Boston youth. Students will participate in the production of their own TV show seen on BNN cable channels that reach three-quarters of Boston homes and online at bnntv.org. We offer two separate workshops at the BNN Charles J. Beard II Media Center in Egleston Square: individual youth are invited to participate in the InFocus TV Studio Production workshop; and the InFocus Field Production and Editing workshop is open to youth-serving organizations. Youth participating in the InFocus TV Studio Production workshop will learn all the skills necessary to complete programs in a TV studio: producing, scriptwriting, camera, audio, lighting, video switcher, graphics, hosting and interviewing. Youth participating in the InFocus Field Production and Editing workshop will learn to produce a BNN TV show – such as a PSA or documentary profile about their sponsoring organization or community. Training includes scriptwriting, camera, audio, lighting, hosting and interviewing, on-location shooting techniques and editing with Final Cut Pro. The InFocus Youth Media program begins Monday, July 14, 2014. Program participants are limited to individual youth between the ages of 12 and 15 years, and to organizations that serve youth between the ages of 13 and 17 years. Space is limited and the application deadline is June 14, 2014.